The owners of Blackpool Football Club have each won £20,000 in damages after they were defamed by a fan on a website. Owen and Karl Oyston sued supporter David Ragozzino over posts on a message board on Another View From the Tower. The posts included "lurid allegations of a sexual nature" and allegations of "fraudulent and corrupt behaviour", a High Court hearing was told. Judge Stephen Davies ruled the claims were of a "defamatory nature". Mr Ragozzino was "passionately aggrieved" about the way the club had been run, the judge added. He had protested against them in person at matches and on the internet. The 32-year-old previously denied libelling the Oystons and was supported by dozens of Blackpool fans at an earlier court hearing. Judge Davies said Mr Ragozzino had "consented to judgement being entered against him". 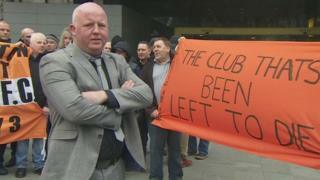 "They [the claimants] accept that Blackpool FC's supporters are entitled to express opinions about such matters, in vigorous terms if they so wish," the judge said. "All of the allegations of sexual misconduct are appalling and must be viewed as extremely serious. "The allegations of fraud and corruption against Karl Oyston are also extremely serious. "Both Owen Oyston and Karl Oyston are entitled to aggravated damages."